Our black zirconia ceramic rings are made from a fabulous new hi-tech material that is being widely used in the aerospace industry, as well as the top levels of motorsport, and high end sports cars that use the material for brake discs. Zirconia Ceramic is made from a silver coloured metal called Zirconium which is very similar to titanium. When Zirconium is baked, and held at high temperature for a long period of time, it bakes into the black zirconia ceramic that you see. The Zirconia Ceramic Ring is a tough ring in wear. Measuring a 9 on the Moh's hardness scale,with a comparable hardness to sapphire, making it very scratch resistant in wear. If you have ever had a sapphire crystal watch glass you will appreciate the strength that this material has. Many black tungsten, or black titanium rings are made from coating the ring with a black plating which does eventually wear off, or if scratched, shows the natural colour of the ring through the plating, making it look very shabby. Zirconia Ceramic is more scratch resistant than titanium, and comparable to tungsten carbide, however in the unlikely event that you do scratch the ring, which will be difficult, the scratch will not easily show through as the ring is black all the way through. Zirconia Ceramic is the 40th element in the periodic table of elements, so we do frequently see these rings purchased as a 40th birthday present. We do also sell a range of the more natural coloured Zirconium Rings by Geti on our other website Quality Titanium on a strictly made to order basis. 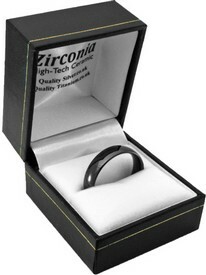 Although we are able to engrave inside our zirconia ceramic rings, it is not something which we advise. The very reason which makes these rings such a great product, also stops them from being engraved. Engraving is basically a controlled scratch, although a little deeper. When this ring is engraved it is almost impossible to read as the engraving doesn't show up where the inside of the ring is also black in colour. The Zirconia Ceramic Ring will be dispatched in an unbranded slim ring box when either 1st Class, or Free UK Delivery is selected as your delivery option. 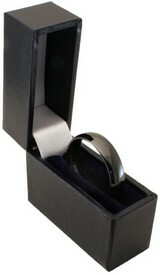 The slim ring box allows us to send the for a cheaper rate with Royal Mail's new priced by proportion policy. This allows us to maintain a free UK delivery and subsidised 1st class service. The ring will arrive in a Zirconia Ceramic branded ring box when Special Delivery, or International Delivery is selected as your delivery option. Please note that we are not able to package the ring in the branded ring box if you have opted for Free Delivery or 1st Class Delivery as the branded ring box is wider than the 25mm limit set by Royal Mail. Brands on our linked websites.